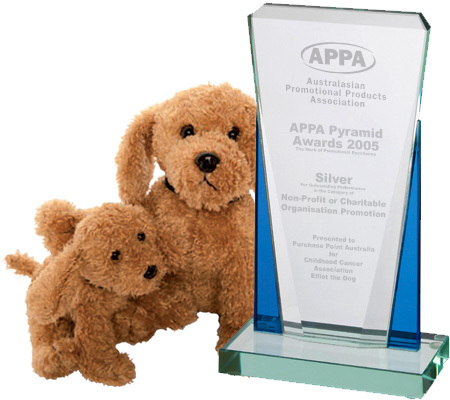 Each year the Australian Promotional Products Association (APPA) acknowledges the most creative promotional companies with Pyramid Awards for Promotional Excellence – the best of the best! We have been commended for an “outstanding performance” in creating a promotional marketing product and campaign for the Childhood Cancer Association, and received an award to recognise our achievement. The Childhood Cancer Association approached us in 2004 and asked if we could develop a soft toy puppy (named Elliot) for them to sell as a fundraising item. The toy was to be”cuddly” and something which would appeal to both children and adults. The key objective of this soft toy was to raise revenue and awareness of the association, and was to be sold at all fundraising events organised by the association as well as through any retail outlets that were willing to carry the product. We developed a toy dog, cuddly, with a soft feel and a lovable face that we believed would meet and exceed the demands of our client. The toy was launched at the Childhood Cancer Associations annual black tie ball in October, with bulk stocks made available to the public in the following days. With the relationships we hold, we were able to persuade a number of larger, reputable corporate businesses including Bank SA, Assured Home Loans and Mutual Community to sell the toy in their branches in the weeks preceding Christmas. The Association was also able to secure “On Air” time with several local radio stations, as well as a local SA television show on Channel 7, all promoting Elliot. Further to our brief, we saw an opportunity to develop a membership club through an on-line registration, to give the new “owners” of the Elliot puppies information about the Association, as well as activities and functions exclusively for owners. To this end we developed a registration disc to be attached to the dog collar, and a kennel that purchasers of Elliot would receive once they registered online. The online website allowed owners to upload photos showing where they had taken Elliot, and photos were taken with Elliot locally, interstate and even overseas. This initiative captured the imagination of the public who continued to visit the website to see where Elliot had been seen, increasing awareness for the association. We’re good at what we do, and your project has the potential to be our next award winning job to be featured here. Contact us today to find out how we can help raise awareness for your organisation!